ATLANTA AJ McCarron threw a 45-yard touchdown pass to Amari Cooper with 3:15 remaining, and No. 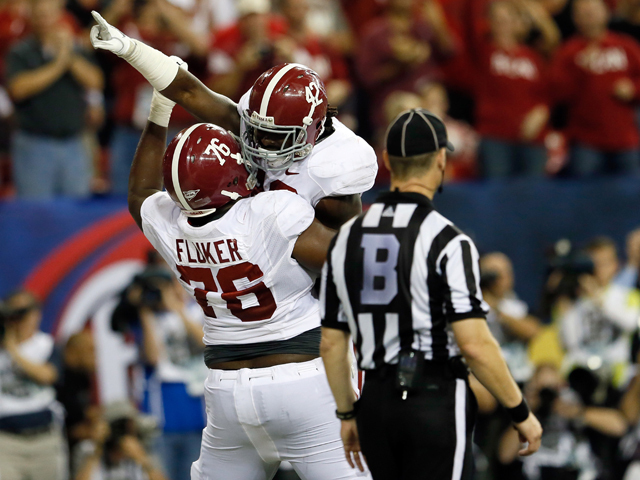 2 Alabama advanced to a national championship showdown with Notre Dame by holding off No. 3 Georgia 32-28 in a thrilling Southeastern Conference title game Saturday. The Crimson Tide (12-1) trailed 21-10 after Alec Ogletree returned a blocked field goal for a touchdown in the third quarter. But after Alabama surged ahead, it was Georgia (11-2) nearly pulling it out. The Bulldogs were at the Alabama 4 after Chris Conley hauled in a short pass but the clock ran out before the Bulldogs could get off another play. Both teams played like champions, but only the Tide is moving on to face the top-ranked Fighting Irish. Alabama finished with 350 yards rushing, an SEC title game record.